We’re partnering with Spaghetti House to help transform lives for children, farmers and their families in Sudan. Between 5 June and 14 July, order Spaghetti House’s specially crafted Crab Linguine, and you’ll not only enjoy great Italian food, but you’ll also help children in Sudan to get their next meal. Every dish sold, will send 50p to World Vision’s farming projects in Sudan, helping families like Munira’s. Munira, 38, (pictured above, left) is bringing up five children on her own, in Sudan. She used to worry every day about whether she’d have enough food to feed her family. She worked for hours every day in the fields but reaped little reward. That was until she joined a farmers group World Vision had set up in her community. Through the group she learned which crops are most nutritious for her children and received training on how to store and use water effectively. “The training really challenged our mindsets regarding farming. 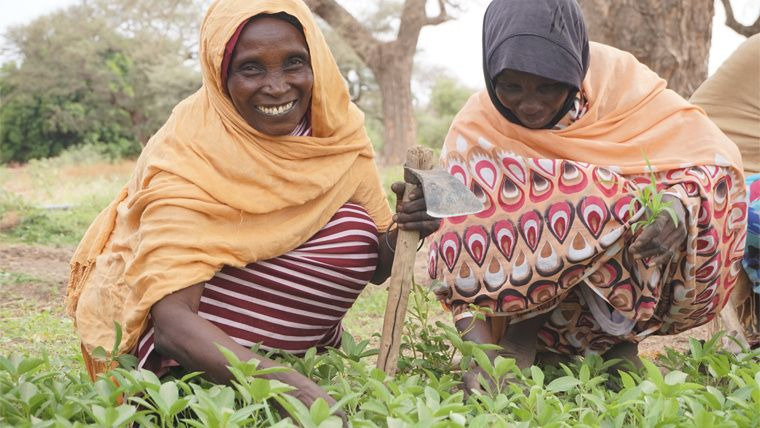 With the introduction to irrigation farming, we are now growing crops all-year round,” Munira explains. Today, Munira grows enough food to feed her children and sells the rest at the local market helping her pay for her children’s education. If you’d like to do even more, you can also give a personal donation to the farmers’ project. Families in the South Darfur region of Sudan have seen their lives and livelihoods torn apart by ongoing civil war and low rainfall. For most families, farming is the usual route for food and income, but for up to four months every year, there isn’t enough food to feed everyone. This ‘hunger gap’ impacts 2 million Sudanese people, almost a third of the population. We’re working in Sudan, with communities facing this hunger challenge. We’re supporting farmers to grow more drought resistant crops, so even when rains fail, they can still harvest and eat. We’re also providing them more efficient tools and training on how to store water more effectively when the rain does come. Farmers who have harvested more than they need are helped to access markets where they can sell the excess at a competitive rate, giving them extra income to pay for essentials like medical care and their children’s school fees. Last year more than 30,000 children and their families were helped and had enough food to eat. And through 2018 – with the support of Spaghetti House and their customers – we aim to work with 3,000 farmers, helping 43,000 people have nutritious food today and, in the years to come.